So you are all probably thinking “Uh huh, he said he would update once a week, yeah right.” LOL. Well, I try, but am only getting time about every other week. Last weekend we had our Annual Helmig Farms BBQ competiton so we were a bit busy. Every year we host a large event (about 60 people this year here at our farm, where locals get together and compete in BBQ’ing in four catagories :Chicken, brisket, ribs, and pork. Medals and trophies are awarded, food and drink provided for every one, and a great time had by all. Alot of visitors seemed to gravitate towards the vegitable garden and asking different questions. As for our summer garden update, we took our last picking of green beans and wax beans on Tuesday night. I still need to pull up the plants as they are all done just have not had the time. We were able to can 27 pints of green beans out of the deal, so that will be nice this winter. 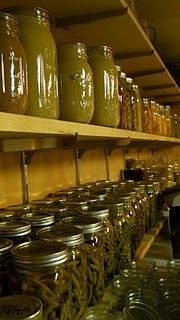 When canning, the wife did her batches just plain beans and some homemade bacon that I butchered and cured last fall. The batches i did i added the same homemade bacon, but also through in some homegrown chopped up white onion. The peas are also all done, we ended up with 4 gallons of peas frozen. They take up alot of room in the garden but are sure yummy, and for pea lovers they are a wonderful treat in the wintertime in casseroles, on salads, etc. The pea plants are already all ripped up. Later this weekend my Dutch Flat Head cabbage is ready, so i will need to shred it and ferment it for sour Krout. Recipes are on the internet as for recipes, it takes about a week or maybe a little more depending on volume, temp, etc. Also i notice my onions have fallen over. Stalks have not turned yellow yet, but will today or tomorrow I am assuming. So i will need to pull them as well, bunch them, and hang them. Hang onions in a cold dry place for maximum keep time. Depending on the species you can keep for example yellow onions almost into next planting season. My white onions for example, or red onions, or walla walla’s will not keep near that long due to their sugar content. You can still hang them, but they will spoil fairly quick. Debating trying some shredding and freezing methods this year for longer keep time on the white onions. Tomatoes are doing wonderful, growing like weeds, and fruiting, but are not yet ripe. Zucchinnis have had one massive picking already. We canned 18 jars of Zuch-relish, and I gave about a dozen Zuch’s away to my mother as she likes making Zuchinni sweet pickles. She wanted to trade me a few jars in trade for the produce, but I don’t much care for sweet pickles, so politely refused. There are about another 50 lbs of Zuchinni that are still growing but not yet ready for harvest. My garlic never did all that great, as they were from 2 year old cloves, but i will take the ones I can and hang for drying to use for re-planting stock next year. Carrots are also all ready for harvest, and are very large. I added some sand into the carrot area before I tilled it this year, and they grew a world better! Much larger in diameter and length. Will probably get 10 pints or so out of the carrots. Peppers are also doing well, jalepenos and bells, and have been being used through out the summer for cooking. I didn’t plant a whole bunch of peppers this year as i still have loads of them in the freezer from years before. On a side note “Sammy” our Yorkshire pig is fattening up nice also, and loving the canning season! Sammy gets all the scraps from canning, and plants i yank up, etc on top of her feed ration. So she is a happy camper, and will be more than ready to butcher in fall. Butcher time is strictly dependent upon pigs weight, and cool weather. I wait till the weather is cold so i can hang the pig and age it for a few days, but not totally cold enough to freeze, as frozen animals are a PAIN to cut up and process. usually October is prime butchering season.